To provide for the needs of the aged poor, Saint Jeanne Jugan traveled the roads of France on foot seeking alms. She was recognized by the begging basket she carried. Knocking on doors, she asked for money, but also for gifts in kind—food, clothing, wood, wool, or whatever was needed for the Home. 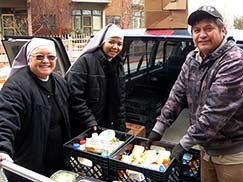 This tradition of relying on the charity of those in the community is continued today by the Little Sisters. Our benefactors and friends are the instruments through which God sustains our work. Today’s "collecting" Little Sisters are often known by their "begging van." We go daily to the markets and places of business seeking food and commodities to offset operating expenses. We also appeal in Catholic parishes as a way to build friendships. For those who do know us, visiting the various parishes deepens the friendships we have already forged and gives the faithful an opportunity to share in our mission. If you wish to be a part of our ongoing collections, email us at clgallup@littlesistersofthepoor.org or call (505) 863-6894. We would be happy to further introduce you to our mission and the many ways you can share in it. Interested in other ways of helping us? Gifts-in-kind are greatly appreciated! Click here for a list of much-needed items. Support us by participating in one of our fundraising events. Thank you for sharing in our mission. Feel free to stop by and see what a difference YOUR gift has made!